NEW HAVEN, Conn. - A strong effort in the defensive zone paced the Providence College men's hockey team to a 3-1 win over Yale on Tuesday night at Ingalls Rink in front of 3,061 fans. The Friars surrendered just 14 shots on goal in the win over the Bulldogs on Tuesday. Providence moves to 9-7-4 overall and concludes its non-conference slate at 8-2-2, while the Bulldogs fall to 6-7-2. Hayden Hawkey made 13 saves for the Friars and his counterpart Patrick Spano turned away 33 shots for Yale. Brian Pinho and Josh Monk each tallied two assists, while Scott Conway, Josh Wilkins, and Robbie Hennessey found the back of the net for the Friars. Wilkins notched his third game-winning goal of the season and his second in the last three games. The Friars found themselves in an early hole just 1:33 into the contest as Billy Sweezey fired a shot from the point that deflected off Frankie DiChiara right onto the stick of John Hayden at the top of the crease and he finished it off to put the Bulldogs up 1-0. The Friars controlled the pace for the remainder of the period, out-shooting the Bulldogs by a 14-3 margin. Sophomore Scott Conway struck for his seventh tally of the season and fifth on the power play as he wired a wrister past Spano and off the post after a half wall feed from Brian Pinho. Captain Josh Monk was credited with the second assist on Conway's goal at 12:17. Conway nearly struck again in the closing seconds of the first as he nearly stuffed home a bid off an odd-man rush, but Spano covered up with the puck resting on the goal line. Providence continued to dominate play in the second period, highlighted by near misses by Jake Walman and Anthony Florentino, whose shots found the iron and out. The Friars finally cashed in after multiple strong shifts as Josh Wilkins cleaned up on Brian Pinho's rebound for his team-high eighth strike of the season with just three minutes to go in the period. Providence held a 26-6 edge in shots after 40 minutes. Robbie Hennessey gave the Friars an insurance goal 5:09 into the third as he re-directed Josh Monk's point shot past Spano to put the Friars up 3-1. 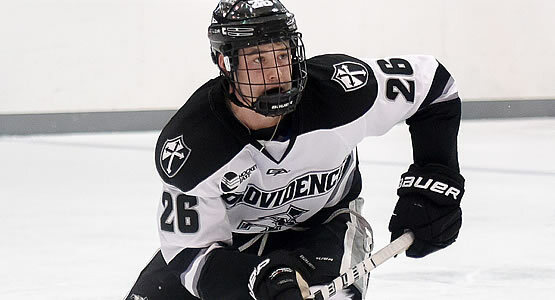 The Providence penalty kill was then put to the test as Brandon Duhaime was assessed a five-minute major and game misconduct and the Friar bench was handed a minor penalty at the 6:17 mark. The Friars limited the Bulldogs' chances to the perimeter and killed off the major and bench minor. Strong structure defensively all evening guided the Friars to the win, as they surrendered just eight shots on goal at even strength. Up next, the Friars welcome in No. 12 Vermont for a two-game set at Schneider Arena this weekend. 1-0 (Yale) John Hayden (DiChiara, Sweezey) - Deflection from the point right out front to Hayden and he fired a quick shot past Hawkey. 1-1 (PC) Scott Conway (PPG) (Pinho, Monk) - Pinho fed Conway from the half wall to the top of the slot and he fired a wrist shot off the post and in. 2-1 (PC) Josh Wilkins (Pinho, Tait) - Pinho's shot from the top of the circles deflected off a Yale defenseman right to Wilkins and he deposited into the empty net. 3-1 (PC) Robbie Hennessey (Monk) - Re-direct off a point shot from Monk after a face-off win. Notes: Power Plays - Yale (0-5), Providence (1/6) ... final shots on goal: 36-14 in favor of the Friars ... shot attempts: Providence 64, Yale 41 ... Wilkins has now scored in three consecutive games for the Friars ... Pinho extended his team lead in points (19) with two assists ... Hawkey has surrendered two or fewer goals in his last nine outings ... Conway and Wilkins each have a team-high five power play goals this season.